I wish to point out that it was 42 on Friday past and it was 86 today. It was 61 yesterday. To say this spring has ranged in extremes is a severe understatement. Over the weekend, I read stories of ice still on Lake Mille Lac in Minnesota and it was 97 in Denver the same day. It's hard to decide what to do about one's domicile with such extremes. Usually, I have the plastic covering the windows removed by the end of April. There are moderating temperatures and the few days it dips back into the low 60's are easily handled. But 42? If you are aware of the "Hitchhiker's Guide to the Universe", that is the universal answer to all mathematical questions, indeed all questions, but it should not be the high temperature in Chicago on the Friday before Mother's Day. I'd take a rainy day over a high of 42. So, the plastic has remained along with the furnace running at night to keep my joints from being stiffer than they usually are in the morning. This prospect of 80's, then 70's over the weekend, however, had me assessing the status of the plastic and the comfort of the cats. 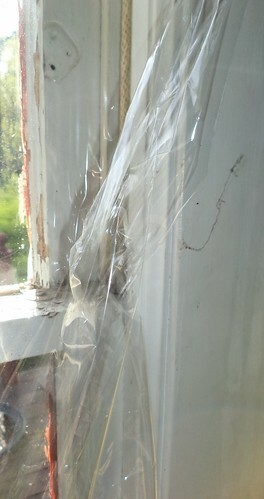 If I remove the plastic, I can fling open the windows for lovely cross breezes, something the girls would appreciate. It means getting up earlier in the morning to make sure the windows are open if the 60 to which the night descends is kept out. That's just a bit too chilly for me to have the windows open. I do not wish to put on the AC in May. I'll tough it out, thank you very much, rather than add to an electric bill that, while going down per watt, is still higher than some people in Asia make in a month. So, I began removing plastic over the weekend. Two windows are open now. 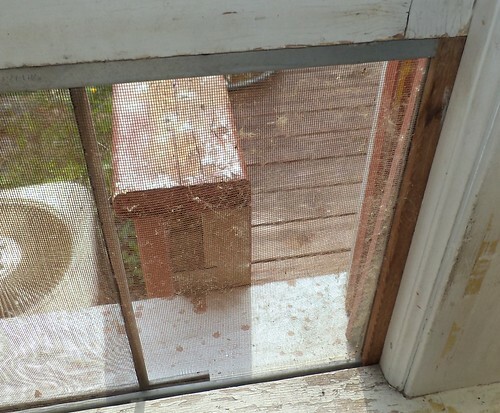 A window in the cat's room was never covered, something I will probably have to rectify this coming fall unless I win that one contest I entered that guaranteed new windows. I have one office window open and will remove the other this weekend. In fact, all the rest of the windows will be freed of plastic on Saturday. It is the ritual of spring. Flowers bloom. Gardens are planted. Plastic comes off my windows. I should wash them, too. I should do a lot of things. In the place of the plastic are the window screens. I found quite a few in the basement this winter. Every window capable of being opened can have a screen this year. There is no reason NOT to have fresh air coursing through the house. Well, there is one. My neighbor to the south spread fresh mushroom compost around her plants in front of her house. I was going to fling my bedroom window open to the world tonight. Um...I'll wait until the weekend.